The Mountain Gorillas have always captured my fascination and I wanted to photograph them in the wild. The gorillas in the zoo’s just do not have the same articulation, feelings, and wildness as the non-captive gorillas. I have been a portrait photographer for many years. Feelings in the eyes, mood and emotions being portrayed in every facial line, is certainly a very important factor of portrait photography. Having the opportunity to photograph another species that show such an amazing range of emotions, so similar to the ways of the human race, is beyond words for me. The Mountain Gorillas are certainly a species that emphasis tangible feelings, emotions, and thoughts through its facial expressions and eyes. I have been told that gorillas can be a bit difficult to photograph due to extensive traveling as well as the physical and environmental challenges needed in reaching and photographing them. While it is a lot of effort and expense for having the opportunity to spend, basically, one hour photographing one of the most endangered species in the world it is worth it! In a lot of ways this just adds to the unique and special adventure that only a very few people will ever have the honor to experience. 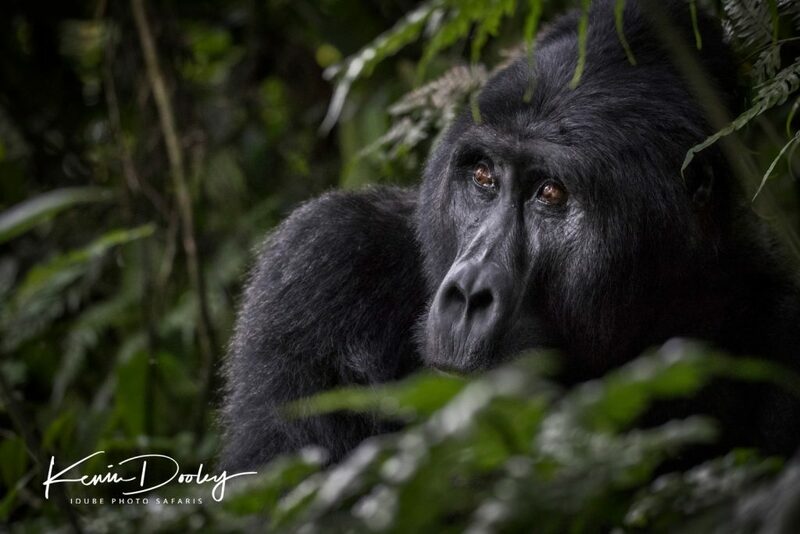 My experience with the gorillas has taught me many of the secrets in both planning and having a successful and productive photographic experience with these primates. When I am asked if is it worth all the effort, my answer is a fast and certain absolute yes. I would have to say that it is one of the most special and unique wildlife photographic experiences I have had. 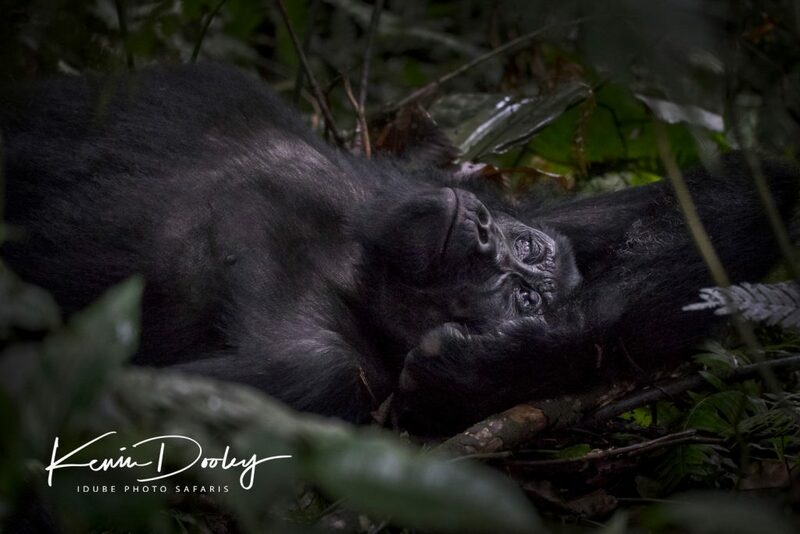 Because I am a safari guide and a professional wildlife photographer, my experiences with photographing the Mountain Gorillas may be slightly different then the average traveler. In most cases, I am already in Africa, coming from another safari when I start this adventure. 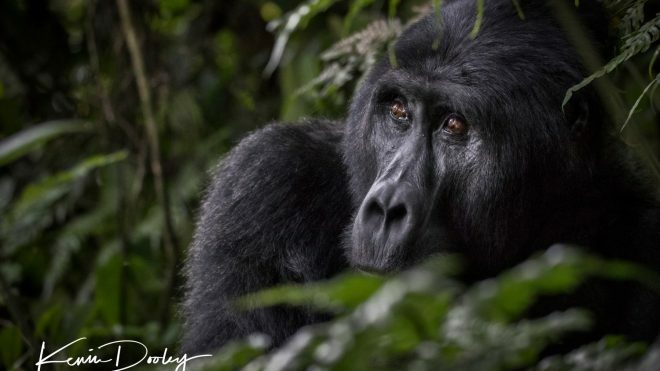 I already own the camera gear and clothing needed for this type of safari and I have the proper connections to the lodges and gorilla guides within the area where we trek for the gorillas. Uniquely, this gives me the advantage to help the Gorilla Trekkers that travel with us in making the journey easier for them. Proper preparation for both the traveling aspects, as well as, the photographic gear and techniques are essential and will lead to a successful and photographically prosperous journey. The comforts of a beautiful safari lodge, good food, drinking water, and time spent with new friends are also a huge part of this experience. The Bwindi Impenetrable Forest National Park is a protected Mountain Gorilla habitat area that also supports other spices such as the chimpanzee, dikers, forest elephants, and many species of birds. The Park was established in 1991 as a project to protect over half of the worlds Mountain Gorilla population. The park is located on the edges of the East African Rift and rests at elevations of 3600 feet to over 8000 feet in elevation. The border of the Democratic Republic of the Congo is just a few kilometers away, the Congo also holds some of the remaining Mountain Gorilla population. A permit is required from the Uganda wildlife services to trek into the forest and photograph the Mountain Gorillas. This is money well spent as Uganda has a very strong and active participation in protecting and saving the gorillas from extinction. The Gorilla Trekking in Uganda is highly organized and controlled through the Ugandan wildlife services. A guide and armed guards accompany all the gorilla trekking excursions, as well as porters and trackers. The adventure starts at the Uganda Gorilla Trekking Center where an orientation takes place and the trekkers are divided up into small groups and assigned guides, porters, and a specific area and group of gorillas to trek into see. Gorilla family’s or troops consist of approximately 20 to 30 members, normally having one male in charge, known as the silverback. Sub-dominate males know as blackbacks also reside within the troops and the remaining individuals are females and youngsters. There are several groups or troops of gorillas that live within the Bwindi reserve and have been exposed to humans over time. This gradual interaction allows humans to now get close to them and capture them in their natural habitat and societal rankings. These "known" troops that the ones that are visited and photographed by the trekkers. It is important to understand that without the effort of the Ugandan wildlife service, the willingness and sacrifices of the Ugandan forest people, and the dollars and efforts of the tourists that visit the area, the Wild Mountain Gorillas could easily be an extent species. The local people have had to change some of their traditional ways of life in order to help preserve this species. The very forest that provided these people food, medicine, and a forest floor to rest upon is now off limits and specifically designated to the Mountain Gorillas and their continued survival. Everything possible is being done to accommodate and provide for these native people who have sacrificed their traditional way of life. Unfortunately, there is only so much the Ugandan government can do to provide and help these brave and willing people to make this life changing journey. This is where tourism plays such an important role in the continuation of the Mountain Gorillas. The money that is spent on the lodges, guides, supplies, and permits provide a very important source of both monetary and emotional support to this amazing project. The few troops of gorillas that are visited by the tourists and the tourists themselves are saving this beautiful species from being a animal family of the past. Yes, it is expensive to visit the gorillas and for many travelers it is a big journey, however, I believe this is money and time well spent. Any visitor who sets foot in this magical place should take pride in being part of saving one of the closest species to the human race. The best advice I can give is to experience the Mountain Gorillas while they are still in the wild and then to do everything possible to also show respect and generosity to the local people for the sacrifices they have made for the very welfare of the gorillas. We can only hope that the people of Uganda sacrifices will be and are being replaced by a better and easier lifestyle that will ensure the continuation and efforts of all those involved. 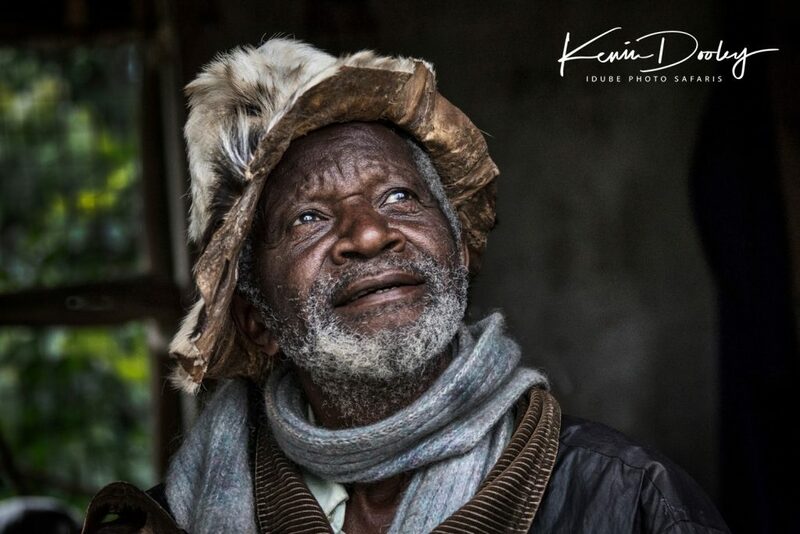 The very essence of tourist's interaction and generosity with the people is the key element, ensuring both the survival of the Mountain Gorillas and the forest people. In Uganda, as I drift off to sleep, I hear the soft sounds of raindrops as they splatter on the banana leaves of our chalets roof. It’s raining, yes, we are in a rain forest and that’s what it does in rain forests. This is a wonderful and peaceful song that could place even the worst of insomniacs into a deep and restful sleep. My mind is flowing between the beautiful sounds of rain drops, the peaceful thoughts of this deep African jungle, and the fact that, come first light, I will be climbing dense wet forested mountains. The hopes of a once in a lifetime photograph making its way into my portfolio are swirling with the ever present worrying thoughts of the rain and camera equipment issues. But tiredness finally takes over and I awake to a morning of bird sounds and the quite happiness of no sound of rain drops. Another one of life’s lessons I suppose, enjoy the moment as it presents itself, tomorrow will take care of itself. In it’s own special way tomorrow will be perfect too. I am not sure why I so often like to write about the smell of fresh coffee. Maybe because I do most of my writing in the morning and of course the scent of a hot cup of freshly made coffee fills my nose and senses, sort of a reminder I suppose. This morning in the depths of Uganda is no different for my coffee obsession and we are greeted by the welcoming voice of our beautiful and hard working Bwindi Mountain lodge camp assistant. The coffee in Uganda is amazing, rich, strong, and carries a unique aroma not soon to be forgotten. The freshly baked sugar cookies, topped off with a candied jelly, that always accompany the morning coffee delivery and wake up call, are also quickly becoming an important part of my day. Following this delicious luxury we tuck into a hardy breakfast of freshly cooked eggs, bacon, freshly made pastries, fruit, and hand pressed coffee, a welcome way to start the day. Today, energy is of the essence, so no dieting on the menu this morning. The very smell of fresh pastries draped in melting butter and traveling up the pathway to my chalet, is definitely more temptation then I can handle. After breakfast we are greeted by our camp manager, who is checking in to make sure everything is running smoothly. Sanctuary Retreats Mountain Gorilla Lodge and the people who run it are second to none and today was no exception. They are busy making sure our lunches are packed just as we like them to be, we have enough water, and all our questions are answered. Next, our handmade walking sticks are presented and fitted, held at our sides and measured by the expert eyes of guides with years of gorilla trekking experience. My walking stick was dark in color, still showing the veins of the wood grain in various shades of tans and browns. A proud gorilla was hand carved upon the crown as if to say welcome and we will make this life changing journey together. My only regret is that I did not keep the walking stick as a lifetime companion. When I go back next year I definitely plan to acquire it then. Moses, our new found friend and guide takes over and we proceeded to the orientation center. My camera bag is stripped to the essentials because I knew the journey would be long and steep. Although porters were provided to carry our gear I was not about to take advantage of them by packing in anything I did not really need. I also did not want to get bogged down with having to make decisions on gear while I was shooting. I decided on two camera bodies, the first, a Canon 1dxmkII for a fast frame rate with high ISO capabilities. I would pair this camera with my favorite wildlife lens, the Sigma 150-600 sport, a very sharp and robust lens. My other camera body is a Canon 5ds, with over 50 megapixels. Under the right lighting conditions, the 5ds produces an image quality that is mind blowing. I pair my 5ds with my Canon 28-300 L lens. This Canon lens gives me a huge zoom range and is also a very sharp lens. Being equipped with both a wide and a zoom lens will allow me the opportunity to photograph the gorillas in just about any situation that comes about. I also threw in a few extra CF cards and some lens cleaners. Upon completion of the orientation, Moses quickly gathers us together with our highly experienced and very outgoing Ugandan Gorilla guide, Rita. Rita is dressed in cameo and wears a green French Beret, set upon beautifully braided hair. Her smile is large and welcoming, her reassuring words a great relief as we knew that the hike ahead could be long and strenuous. We had been assigned to a group of gorillas that was a bit of a distance from the orientation center. A forty five minute drive through the mountains roads would be necessary before reaching the drop off point where we would pick up our porters and start our journey on foot. 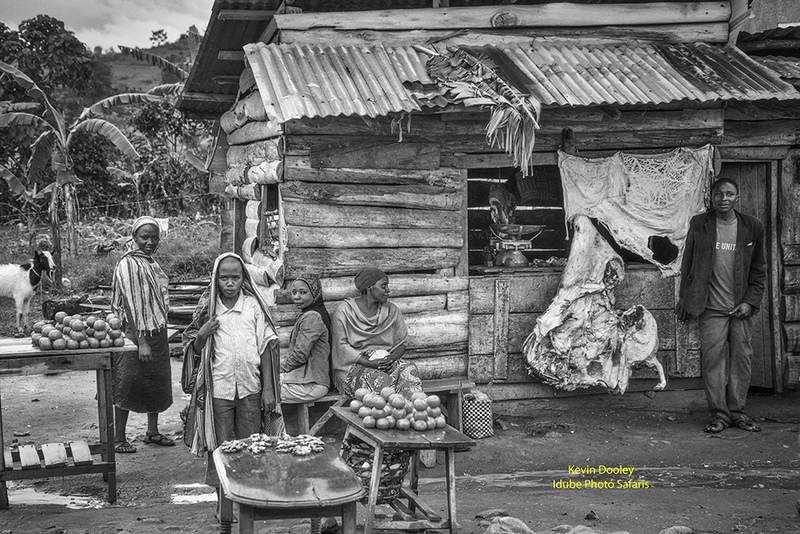 Throughout the boundaries of the Bwindi National Park, small villages and walking trails exist. We would make our way along one of these boundary trails to avoid the least amount of bush whacking possible. Approximately 45 minutes into our hike we left the trail that the villagers commonly use and proceeded up the side of a steep mountain that was covered in black tea and maze crops. Upon reaching the top of the mountain we crossed over the park boundary and headed into the dark and deep forest of the reserve. At this point we still have no indication that the gorillas had been located. Early this morning several trackers were sent out ahead of us to try and locate the particular troop of gorillas that we were assigned to. These highly skilled trackers go to the area where the gorillas were last seen and start following their tracks. Often, they are able to locate the nesting site where the gorillas would have spent the night time hours. Then, they can continue on and locate their present position. The trackers stay in touch with us throughout the process and keep us up todate on the progress. We would not get the anticipated radio call for well over an hour into our hike. As we work our way down into a deep canyon, my thoughts are filled with just how stunningly amazing this place is. Everywhere I looked, including up, was covered in thick, green lush vegetation. My mind drifts to the old Tarzan movies, the thick vines that Tarzan swung upon through the jungles of Africa were all around me. This place id supper cool. The thick mountainous rain forest is colored in every shade of green and life is abundant. All sorts of shapes and sizes of leaves, wild flowers, and types of moss cover the forest floor, with every step a dance of decision making. Given the vegetarian diet of the gorillas it makes perfect sense that they would reside in this mountain paradise. Rita has finally informed us that the gorillas have been located and they are approximately a 30 minute hike from our present location. Depending on the difficulty of the jungle we would need to traverse, we could make it in less time, however there is no trail so we will be creating our own path. With machetes in motion we are off and heading into the thickest jungle I have ever set foot in. After maybe 15 minutes or so Rita makes a call that I can only relate to some sort of a war cry. Hands around her mouth, creating a homemade megaphone. a location call that gets a response almost immediately. We are close now and heading straight in the direction of the responding call from the trackers. The bush becomes thicker as we proceeded towards a semi clearing in the vegetation. I can see the trackers waiting for us and my excitement skyrockets into high gear. We finally spot the gorillas on the hillside just opposite of our position. A quick stop to gather the cameras and ready them for photographing the gorillas. I place my Canon 1dxmkII with my Sigma 150-600 on my tripod and set the camera at my starting settings. ISO 1600, f7.1, and a shutter speed of 640 . My Canon 5ds fitted over my shoulder with the Canon 28-300 lens. I have decided to go with an ISO of 800 on the 5DS. The f stop will be set at 7.1 and the shutter speed will be set at 1/400th. Unfortunately, the gorillas soon move into the deeper forest and these settings would just become wishful thinking. I also quickly learn that a tripod is way too much trouble to try and maneuver through the thick brush. A monopod would have been a much better choice. The tripod is too time consuming, as it easily gets tangled in the thick underbrush. The constant movement of the gorillas would also mean having to maneuver the camera into various heights and positions to try and get a clean image of the gorillas. The constant battle of thick brush both covering the gorillas faces and eyes and the challenges of physically getting through the brush presented difficulties and distractions that just had to be overcome. The movement of the gorillas from one place to another also created changing lighting conditions that had to be adjusted for with higher ISO’s and slower shutter speeds. Depending on where the gorillas are located determined the degree of difficulty I had to overcome to get great images. 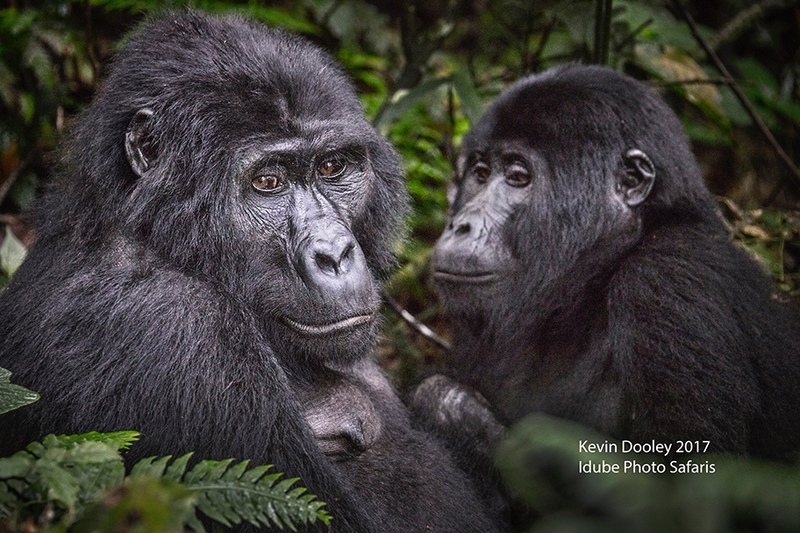 The challenges of photographing the Mountain Gorillas are many, and certainly can vary depending on the location. Some of the more common concerns for the photographer can be addressed with the proper preparation. Other concerns are really a matter of weather, light, movement, and just plain luck. My advise to the serious photographer comes in both preparation and technique. Do not change lenses in the humid environment. This can cause fogging within the camera body. I suggest two camera bodies, one with a wider lens and one with a strong telephoto lens. When in a air conditioned room, keep your cameras in a high quality moisture proof tightly zipped camera bag. Do not open the bag and let in the conditioned air while inside the room. Allow your camera bag and it’s contents to slowly adjust to the outside temp before opening it. At least 20 minutes. Best to remove your camera from the air tight case and carry it, the airtight seal on most high quality camera bags is so good that it will prevent the lens from completely acclimating to the outside elements. Keep several moisture absorbing packets in your camera bag. If possible and safe, place your camera bag in a non air conditioned room while sleeping overnight. Attach a couple pouched lens cloths to your camera strap, or keep them handy in your pocket. Remember to remove your cameras from the camera bag at least 20 minutes prior to your photography time. This allows the cameras to properly acclimate to the environmental conditions. Take only the necessary gear, the hike to the gorillas can be long and strenuous. Good quality rain gear for both your camera and yourself are a must have. Higher ISO’s may be required. The gorillas are normally in thick and shady areas. that can create huge shadows around the eyes. It’s best to photograph them in shady areas. In direct sunlight look for opportunities when they are facing a direction where the light will fill in these dark areas around the eyes. Gorillas have very dark skin which reflects beautiful highlights, even in the shady environments. Tripods can be difficult to use in the jungle environment. The legs get caught up in the forest clutter and become very difficult to move around. Monopods are a good way to have some camera support, yet are much more mobile and easer to use than tripods. A good lightweight gimbal head such as the ProMediaGear Katana JR is essential when using heavy and large lenses. Compose both close up portrait and full body environmental images. 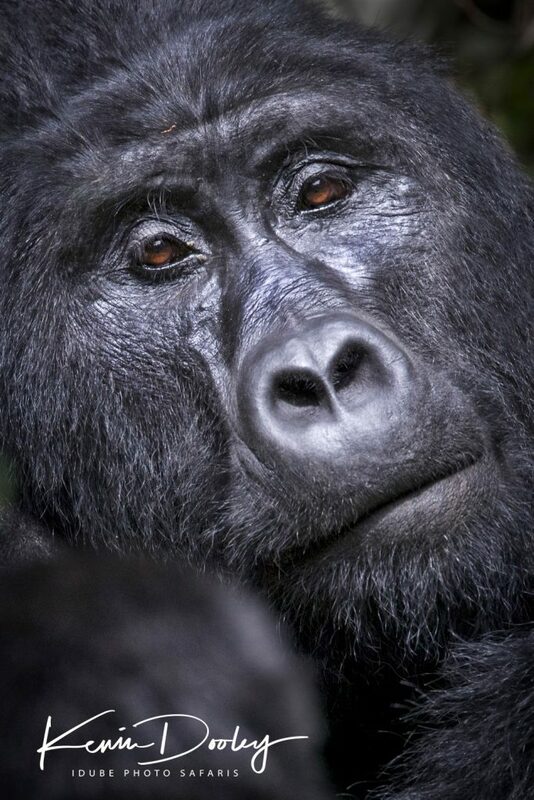 Look for expression in both the eyes other facial features, gorillas are highly expressive. Gorillas have relatively short nose to eye ratios. Smaller depth of field settings such as 5.6 to 7.1 will give you additional light as well as a shallow depth of field. Allowing the busy backgrounds to fall out of focus. Remember to use a fast enough shutter speed to prevent motion blur in both the camera and the subject. The rewards of such an experience are to many to count. To walk with such an incredible species in their natural habitat is beyond the words of this humble photographer. To photograph them is the ultimate icing on the cake . This encounter will leave me fulfilled in a way that has no equal. A beautiful species that is on the verge of disappearing forever. A unique species that shares not only DNA but the very thoughts and expressions as humans. A insightful species that requires hours of flight time, visas, hotels, hiking, and shear guts to get a glimpse of. A mysterious species that leaves you full of joy and sadness all at the same time. This is certainly a safari and photographic journey that needs to be on the bucket list of all of adventurers. Maybe even at the top of the bucket list. If you go, definitely consider yourself be part of a very small and special group of lucky and blessed people. All incredible things in life require that first big step and this journey is absolutely a incredible thing.